Genetic diseases can be diagnosed using a variety of methods: physical exam, personal/family medical history, or tests performed in a laboratory. 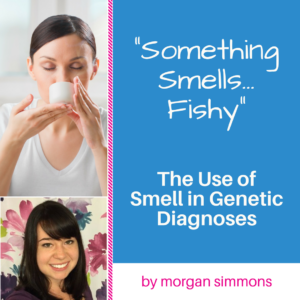 But, did you know that smells can also be used to make a diagnosis for some genetic diseases? It’s true! Smells are caused by small, unstable compounds that activate the olfactory receptors in your nose. These compounds can often be detected in extremely small concentrations. There are several genetic diseases that prevent an individual’s body from breaking down certain compounds. When these compounds build up in the body, they can cause specific smells! Trimethylaminuria (TMAU) is a rare genetic disorder that causes a distinctive fish-like body odor. The odor occurs when unusually high levels of trimethylamine (TMA) are released in the urine, breath, and sweat. The odor is described as smelling like rotting fish or rotting eggs. A diet avoiding foods with high levels of TMA can improve this odor. Maple syrup urine disease (MSUD) is an inherited metabolic disorder named after the hallmark maple syrup odor of the urine. This unique odor is caused by an accumulation of amino acids in the urine. Treatment for MSUD is through dietary restriction of branched-chain amino acids. With treatment, affected individuals may remain healthy and live through adulthood. Phenylketonuria (PKU) is a rare genetic disorder in which people lack a substance in the body called phenylalanine hydroxylase (PAH). This deficiency causes elevated phenylalanine levels in the body. One of the unique features of PKU is a “mousy” or “musty” odor to the skin, hair, sweat and urine due to the elevated phenylalanine levels. Isovaleric acidemia (IVA) is a genetic disorder that causes a buildup of certain acids in the body, called organic acids. One of the unique features of isovaleric acidemia is a “sweaty foot” odor of the person with this condition when they are sick. Although these diseases are each associated with a specific smell, it’s important to remember that they are also accompanied by other signs and symptoms and require the examination and treatment by a geneticist and/or other healthcare providers. You can find additional information about these genetic diseases on the ThinkGenetic website. It may also be helpful to contact a genetic counselor near you using the NSGC find a genetic counselor webpage. 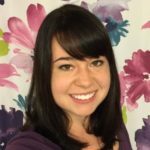 About Morgan Simmons – Morgan received her master’s degree in human genetics and genetic counseling from Emory University in 2017 and is currently a genetic counseling fellow at the Emory University Lysosomal Storage Disease Center and a ThinkGenetic contributor. Morgan is a certified genetic counselor who received her master’s degree in human genetics and genetic counseling from Emory University in 2017. She currently works at Emory University as a genetic counselor specializing in Lysosomal Storage Diseases and is a regular ThinkGenetic blog author. Morgan also offers general information and resources to those who reach out to ThinkGenetic via email and social media. Thank you for this article on a subject that needs more awareness. Two of my children have Isovaleric Acidemia and had medical professionals known that the smell exhibited at 18 months and again at age 3 1/2, my son Stephen , now 19, was associated with Isovaleric Acidemia , his brain injury could have been prevented. You’re very welcome, Jana! We at ThinkGenetic hope that by increasing awareness we will be able to encourage earlier diagnoses for conditions such as isovaleric acidemia. I’m so sorry to hear about your son, but I wish you and your family the best.